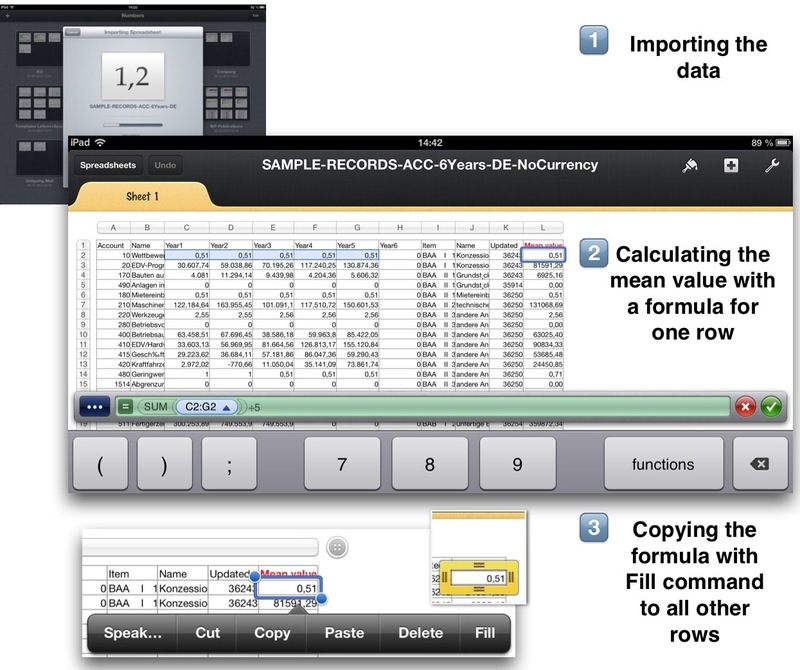 Accounting data are to be imported on an iOS-Device. The data source is a CSV file exported from Microsoft Excel or Microsoft Access. As you can see CSV files are readable files with single lines where the data are separated by a delimiter (a semi-colon or a tabulator) and thus ordered in columns. Nearly every application is capable of importing data from those files as it is a received standard all over the world. The data receiving applications are Tap Forms HD for the iPad (Tap Zapp Software Inc., Canada) and Numbers (the spreadsheet part of Apple’s iWork-Suite). The device is an Apple iPad 3 with 64 GB storage capacity. If you want to import data to Tap Forms HD or Numbers you should know something about the formatting options for numbers and the encoding of text. Format cells with numerical content as numbers (not as currency). Adjust the decimal places and set the 1000-separator. There are lots of options when exporting data from Microsoft Access to a CSV file. Use ‘Export to Textfile’ to set up the appropriate values. The settings can be saved for further exports. Just importing data is unprofitable arts. So in both applications the mean value of the 6-years accounting data is calculated as an example. For Year6 all values are zero so the mean value is taken just from the first 5 years. As it is not possible to directly access data in iCloud you must use the Numbers functionality ‘Copy from WebDAV‘ to get the import file. Unfortunately Dropbox does not support WebDAV access while Tap Forms HD does. If you have the file elsewhere you may use the ‘Open in‘ command. It works also in the iOS Dropbox app. What you should know is that the Dropbox app does not show you the contents of a CSV file (App version 2.0.2). If the file is downloaded the import starts directly and you don’t have to set any options. It took 12.5 sec to scrape the CSV plate. It took another 15 sec to kick it into iCloud. And it was a bit crazy to drag the yellow ‘Fill’ rectangle over 389 rows. 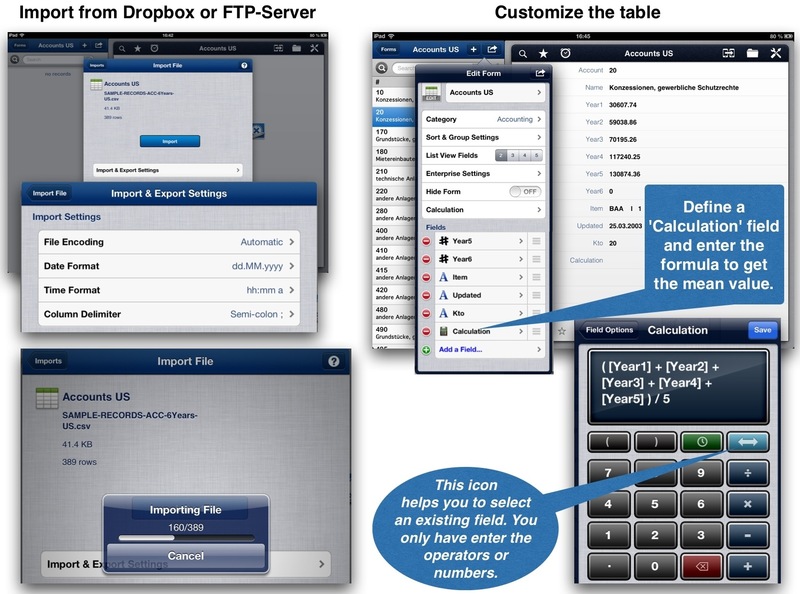 There is an easy way to prepare for an import by letting Tap Forms HD automatically create a table. In this case all fields are imported with field type TEXT and thus cannot be included in calculations. Tap Forms HD does not first analyze the data and then set the correct field type. Also Apple’s Numbers cannot identify field types. After importing into Numbers the relating columns have to be formatted as numbers before including them in formulas. As an alternative you do this automatic import and after its finished change the field type for numeric values from Text into Number, delete all records and restart the import. Here are the steps to do the import with Tap Forms HD. There are not many rows imported in Numbers nevertheless Numbers reacts a bit spastic when adjusting the column width, setting any formatting or adjusting the column width. A benefit of Numbers is the free-style formatting, printing all data and a large number of built-in functions for more complicated calculations. Import options are not available following Apple’s KISS principle. Usability problems already come up with more than 300 records. Numerical values can be compared in charts. Importing into the Tap Forms HD database (SQLite based) is recommended for a larger amount of data and usual operations on numerical values. The SQLite database working in the background does not have any performance problems even with the 65535 records I imported in my test-environment (Performance: 2 min/1000 records). As i wrote in my blog ‘To the limits’ Apple’s Numbers crashed long before reaching this limit. In Tap Forms HD queries (respectively Searches) can be executed and saved for further usage. This feature is not available in Numbers but often needed to reduce the total contents to the relevant records. Printing of records is available but currently just for a single record. You might say printing is old-fashioned but if you extracted relevant records (e.g. all records starting with 8 in the account number (these are accounts related to items like Sales in the Profit and Loss Account) or account values greater than 500.000) you usually want to print them out as a spreadsheet and review the data without the need of any device. Tap Zapp Software, the developer of Tap Forms HD, is highly innovative and its just a question of time until app updates bridge some current gaps. Can both applications work hand in hand? Yes, they can. Use Tap Forms HD to define a search rule (query), export the subset as CSV file, and import it in Numbers for further processing. There is one feature of Tap Forms that allows to include field-type tags in the header row to tell Tap Forms which fields are numbers and which are text or dates or other field types. It can be used when migrating from a previous database app to Tap Forms HD.